The Taiwanese Solar Industry has a long history with solar cell makers Motech and E-Ton establishing themselves globally way back in 2006. However, the Chinese with their low cost manufacturing left Taiwan far behind. Taiwan is a hub of semiconductor manufacturing with some of the leading companies like TSMC, AUO, UMC, HTC etc. Taiwan has been predominantly present in the solar cell part of the supply chain but lacks polysilicon manufacturing. The absence of vertical integration led to high costs in the Taiwanese solar market. The Taiwanese solar industry has seen various ups and downs due to volatile nature of the global solar geopolitical currents. Many Chinese companies used the Taiwanese solar cells to avoid anti-dumping duties imposed by the U.S and Europe, till U.S included these companies for imposing ADD on Chinese made modules. You can read more about the Taiwanese Solar Industry here. The Taiwanese government has set a target to make the island nuclear-free by 2025. As such it expects solar power installations to account for more than 70% of total renewable energy capacity by 2025. Currently renewable sources account for less than 5% while nuclear power accounts for around 14% of Taiwan’s total electricity generation. Taiwan receives a good amount of solar radiation and hence solar installations can make exponential progress in the island similar to other parts of the world. Taipei, the capital city of Taiwan has a current installed capacity of 1061 MW, which it plans to double by mid-2018. Taiwan therefore needs to install solar twenty times faster than the current installation rate over the next decade. However, Taiwan is a small island and such installations need huge area. Other than space constraint, is the problem of grid transmission and connectivity. 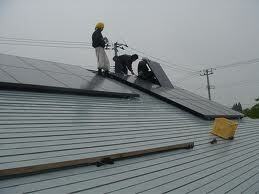 Given the land constraints in Taiwan, rooftop solar installation seem a viable option. The Pingtung prison in Taiwan has encouraged the installation of rooftop solar and has also initiated plans to train the prison inmates on installation process. The Pingtung prison has become a pioneer in transferring the solar power generated into Taiwan’s electricity grid. Not only will this help the island to sustain using renewable sources of power, but also create job opportunities and a sense of accomplishment for the prisoners who now dream of getting jobs in the solar industry. Given the huge solar installation target and space constraints, Taiwan should definitely go the rooftop way!